Lifestyle risk behaviours, such as smoking, excessive alcohol intake, poor diet and physical inactivity, are important contributors to morbidity and mortality. WHO identified that these behaviours are responsible for 29 per cent of the disease burden in the most industrialised countries (1). These risk behaviours consistently cluster among certain population subgroups, such as those with lower socioeconomic status. They are unequally distributed in the population and are impacted upon by the wider social determinants of health. Michael Marmot’s Review of Health Inequalities called for a proportionate universal response whereby actions to prevent ill health are universal, but with a scale and intensity that is proportionate to the level of need. Lifestyle risk factors such as whether someone smokes, how much alcohol they drink, what they eat and whether they take regular exercise are widely recognised as affecting their health and risk of dying prematurely. In 2002, the World Health Organisation identified that in the most industrialised countries, alcohol and smoking, low consumption of fruit and vegetables and lack of physical activity were associated with about 29 per cent of the disease burden, estimated by disability-adjusted life years (DALYs) lost (1). These behaviours are also linked to hypertension, high cholesterol, obesity and overweight which are associated with diseases including coronary heart disease, diabetes and cancer and are responsible for a further 15 percent of the disease burden in these countries. Close to half of the burden of illness in developed countries is therefore associated with the four main unhealthy behaviours (2). In England around a quarter of people are engaged in three or four lifestyle risk behaviours, while only 6% engage in none of them. These factors are likely to interact with one another to further increase the risk of premature death (3). 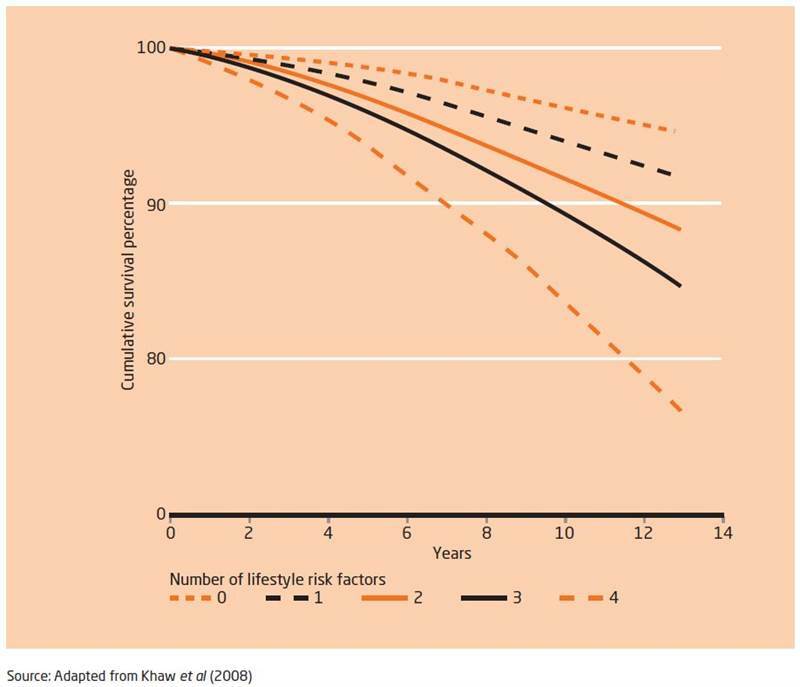 Figure 1 shows the relationship between multiple lifestyle risks and mortality (2). People with multiple lifestyle risk factors are unequally distributed in the population and are associated with wider social determinants of health. For example, people with learning disabilities are more likely to have poorer health due to factors such as poverty, poor housing conditions, unemployment, social disconnectedness and overt discrimination (4). These factors all contribute to poorer health, shorter lives and increased health inequalities among those in greatest need. In order to address wider determinants that will support behaviour change, multiple organisations, across different sectors need coordinated action and approaches to help support people to tackle multiple lifestyle risk factors. Figure 2 shows the causal relationship between different factors, and how they can have both positive and negative influences on people’s lives, and also undermine health and wellbeing, both for individuals and communities. Table 1 shows the priority groups in Surrey for each risk factor. 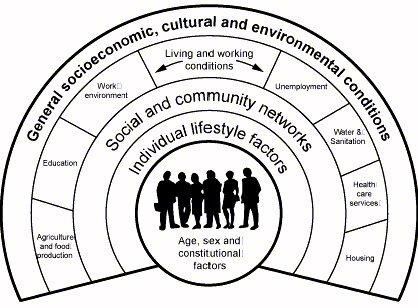 In order to understand who is at risk and why, it is important to understand the root causes and determinants of population health as highlighted in Dahlgren and Whitehead’s model in section 2. Table 1: priority groups in Surrey for each risk factor. Synthetic estimates of numbers of Surrey residents engaging in multiple lifestyle risks suggest that approximately 243,700 adults in Surrey are engaging in 3 or 4 lifestyle risks, this represents 27% of the 16 and over population. Just over 614,700 Surrey residents (67%) are likely to be engaging in 1 or 2 risky lifestyle behaviours. The remaining 55,200 are not engaging in any of the four unhealthy behaviours described. 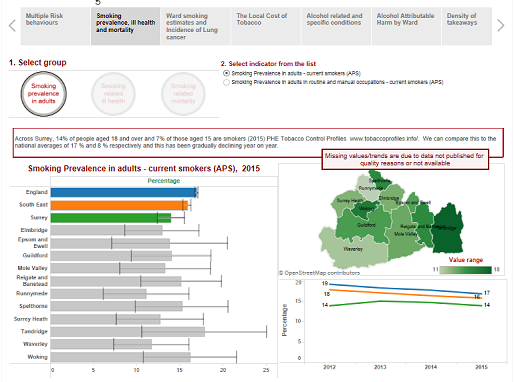 See Tableau Visualisation, It shows that people with no qualifications are most likely to engage in more risky behaviours. Smoking is the primary cause of preventable illness and premature death. Smoking harms nearly every organ of the body and reduces both quality of life as well as life expectancy and greatly increases the risk of cancer, cardiovascular disease and respiratory disease. Across Surrey, 14% of people aged 18 and over and 6.8% of those aged 15 are smokers (2015) (6). We can compare this to the national averages of 16.9% and 8.2% respectively and this has been gradually declining year on year.Smoking rates are much higher among our more deprived communities, having a significant impact on increasing health inequalities by reducing life expectancy in these groups. The smoking rate amongst Surrey residents in routine and manual occupations is 22.5% (6). People from our most deprived communities are more likely to smoke, have greater levels of dependency and are less likely to quit than more affluent smokers (7). Local smoking prevalence data estimates higher smoking rates in areas of socioeconomic deprivation such as in Walton North, Town, Preston, Westborough, Old Dean, Maybury and Sheerwater, Valley, Stanwell North, Englefield Green West and Godalming Centre and Ockford wards. Recent research from Action on Smoking and Health (ASH) estimates there are about 87,000 households in Surrey with at least one smoker. 21% of households with a smoker fall below the poverty line. If these smokers were to quit, around 6000 households in Surrey would be elevated out of poverty (7). Smoking prevalence varies greatly between ethnic groups and between men and women within these groups. Whilst smoking prevalence amongst minority ethnic groups is generally lower than that of the general population, some have higher rates, most notably amongst black Caribbean, Bangladeshi and Chinese men. The use of niche tobacco products (such as shisha and smokeless tobacco) is also higher in certain ethnic groups. Information from the 2012 Integrated Household Survey suggests that adult smoking rates are higher among Gypsies, Roma and Travellers at around 30% although the sample size is small and may not be fully representative (8). Approximately four times as many people in prisons smoke than in the general population, with similarly high levels of smoking found among those in police custody and probation (9). A 2014 survey of smoking in six prisons across Kent, Surry and Sussex reported smoking rates of between 62% and 81%. Currently there is no Surrey specific data available for smoking amongst prisoners, however with five prisons in Surrey, these numbers would be considerable. Smoking not only impacts on the health of the local population but also has a negative impact on the local economy, costing an estimated £252.4 million to society in Surrey every year (11). Breathing in other people’s cigarette smoke is called passive or secondhand smoke and comprises of sidesteam smoke from the burning tip of the cigarette and mainstream smoke which is smoke that has been inhaled and then exhaled by the smoker. In the UK around 2 million children are estimated to be regularly exposed to secondhand smoke in the home and many more are exposed outside the home (12). Tobacco smoke contains over 4000 chemicals including tar, nicotine and benzene. Immediate effects of exposure to secondhand smoke include eye irritation, headache, cough, sore throat, dizziness, nausea and effect on the heart. In the longer term, passive smokers suffer an increased risk of a range of smoking related disease including lung cancer and coronary heart disease (12). An estimated 11,000 people die each year in the UK as a result of passive smoking (13). The 2015 Surrey Health Related Behaviour Survey showed that 21% of primary school pupils and 31% of secondary school pupils responded that their parents/carers smoke. 6% of primary school pupils and 9% of secondary school responded that someone smokes indoors at home in rooms that they use (14). Alcohol misuse means drinking excessively or more than the recommended limits for alcohol consumption. In the UK, alcohol use is categorised by level of risk as defined by alcohol units – lower risk, increasing risk and higher risk (table below). Higher risk drinking can be sub-divided into complex and non-complex. An example of a higher risk drinker with complex needs is an individual who has a mental health diagnosis or who is affected by domestic abuse. A small proportion of those drinking at higher risk are alcohol dependent. Drinking above recommended levels increases a range of health risks including hypertension, stroke, heart and liver disease, pancreatitis, depression, anxiety and insomnia. In addition, the most recent review of evidence suggests that the protective effects of alcohol at low levels (ie to heart health) have been over-estimated. For information on higher risk drinkers with complex needs and alcohol dependency, please see Substance Misuse JSNA. spread evenly across 3 or more days. Increasing Risk 15-49 units per week. 15-34 units per week. One alcohol unit is equal to 10ml (in volume) or 8g (in weight) of pure alcohol. It was previously estimated that 21% of adults in Surrey who drink, do so at increasing risk levels and 6% at higher risk levels. Around 2% of higher risk drinkers are alcohol dependent. LAPE estimates for lower risk, increasing and higher risk drinking are now under review by Public Health England. Alcohol statistics published by the Health and Social Care Information Centre in 2016 indicate that while admissions rates in Surrey remain significantly lower than England, the narrow measure is showing a year-on-year increase in alcohol-related admission episodes locally, with an 11% increase between 2008-09 and 2014-15. In addition, the broad measure indicates that Surrey has statistically significantly higher rates of alcohol-related hospital admissions compared with the South East region. Data from Surrey’s Don’t Bottle It Up website for 2015-16 indicates that 22% of people that complete the alcohol assessment drink at lower risk levels, 43% at increasing risk, 14% at higher risk and 21% are possibly dependent. It is recognised that those who are drinking excessively may be more likely to visit the website and complete the alcohol assessment. Physical inactivity has been identified as the fourth leading risk factor for global mortality causing an estimated 3.2 million deaths globally (16). It is also the fourth largest cause of disease and disability in the UK accounting for one in six deaths (17, 18). The UK Chief Medical Officers’ Guidelines for Physical Activity (19) recommend that adults (19-64 years) and older adults (65 years plus) do at least 150 minutes of moderate intensity physical activity per week, or 75 minutes of vigorous intensity activity per week (or a combination of the two). All adults should aim to incorporate activity to improve muscle strength on at least 2 days per week and should also minimise the amount of time spent being sedentary for extended periods. For older adults at risk of falls, activity that improves balance and coordination should be incorporated on at least 2 days per week. Physical activity is not only fun and enjoyable, it is essential for good health. Physical activity can prevent or help to manage over 20 conditions and diseases including coronary heart disease, type 2 diabetes, some cancers, stroke, musculoskeletal conditions and obesity. For example, there is strong evidence that being physically active can reduce your risk of type 2 diabetes by 35-40% and your risk of colon cancer by 30-50% (20). It can also help improve people’s mental health as it has a positive effect on wellbeing, mood, sense of achievement, relaxation and release from daily stress (21). Being physically active increases the chance of staying independent in later life as evidence shows it reduces the risk of falling by 30% as well as reducing the risk of the conditions and diseases mentioned above. The Health Impact of Physical Inactivity (HIPI) tool demonstrates how many deaths/cases of certain diseases could be prevented if the 40-79 yrs population was sufficiently active. The data estimates that if 100% of the Surrey population (aged 40-79) were sufficiently active, 637 deaths could be avoided (22). These figures are based on the time period 2009/10. Not only does physical inactivity have an impact on the individual in terms of poorer health outcomes and quality of life, this also has a significant impact on healthcare services and the wider society. Long term conditions like diabetes, cardiovascular and respiratory disease can lead to greater dependency on domiciliary care, residential and ultimately nursing care. This creates avoidable costs for local authorities as well as economic and social pressure on families. The total estimated cost of physical inactivity in Surrey in 2009/10 was £17,959,001 (23). The Active People Survey, commissioned by Sport England, is a large telephone survey that measures physical activity and sport participation in adults aged 16 and over. The data can be broken down by gender, age, ethnicity, disability, education, work status, social grade, faith, sexual orientation, BMI and geography and records activity levels ranging from inactive (less than 30 minutes physical activity per week) to active (at least 150 minutes physical activity per week). Therefore we are able to see how physical activity levels vary between district or borough in Surrey and by demographic group. The Active People Survey (APS9) data 2014-15 for Surrey (24) show the following groups to have lower levels of physical activity: people living in lower income households; females (starting from adolescence); older adults; BME groups and people living with a limiting illness or disability. The data show a clear gender gap with females participating in sport on average 20% less than males. Similarly people with a limiting illness or disability are half as likely to take part in physical activity and sport and their experiences are less positive than non-disabled peers. In addition to the groups mentioned above, all people with sedentary jobs (such as office jobs, driving jobs and any work that requires sitting for long periods) and those undertaking sedentary behaviour in leisure time (such as spending long periods on the sofa, watching TV or sitting at the computer) can be putting their health at risk; this applies even to those who are already undertaking vigorous regular exercise. Prolonged periods of sedentary behaviour can increase the risk of type 2 diabetes, heart disease and lower levels of aerobic fitness. Public Health guidance suggests that workers who are predominantly desk-based should initially aim to achieve 2 hours per day standing/light activity, progressing towards accumulating 4 hours per day during working hours (25). In Surrey 63.1% of the population are meeting the CMO guidelines of 150+ minutes physical activity per week compared to 57% in England. Waverley has the highest number of people meeting the guidelines (69.3%) and Spelthorne has the lowest (55.8%). The latest data (APS9 Jan 2014-Jan 2015) show that physical activity levels decline considerably with age. For example whilst one in five (19.2%) of adults in Elmbridge (aged 16+) were deemed inactive, there was a steep increase in the over 65 population to more than half (51.9%) being deemed inactive. The same data show that in Elmbridge a person living with a disability is 2.5 times more likely to be inactive as a non-disabled person. As mentioned above, physical activity levels also vary according to gender: in Surrey 26.1% of females (16+) are deemed inactive as compared to 17% of males. The gap is particularly marked in Epsom & Ewell where more than a third (34.4%) of females are inactive as compared to 11.7% of males. Using Mosaic segmentation we can estimate how physical activity levels may vary widely between different wards in the same borough. For example in the Borough of Woking, Mosaic data estimates that 34.8% of the 15+ population in Horsell East & Woodham ward are not doing any exercise, as compared to Maybury & Sheerwater ward where it is estimated 49.2% are not doing any exercise. These differences are reflected in the APS9 data where 19.5% of the Surrey population (16+) on upper social grades are deemed inactive whereas 29.7% on lower social grades in Surrey are deemed inactive. 4.8% of the adult population in Surrey are cycling at least 3 times per week and 17.5% are cycling at least once per month. Woking is the borough with the highest number of people cycling at least 3 times per week (8.5%), followed by Guildford (7.5%) and Tandridge is the lowest (1.5%) (26). 49.8% of adults in Surrey walk at least 5 times per week, which is slightly lower than England (50.6%). The borough with the highest number of people walking at least 5 times per week is Guildford (56.6%) and the lowest is Spelthorne (37.7%). The proportion of adults in Surrey who use outdoor space for exercise or health reasons is 24.9% as compared to 20.1% in the South East. The UK ranks 8th for overweight prevalence (including obesity) for men and women combined, out of the 34 OECD (Organisation for Economic Cooperation and Development) countries. According to the PH Outcomes Framework indicators (2015) 61.1% of adults in Surrey are carrying excess weight. Although lower than the national prevalence of 64.6%, it equates to approximately 550,000 adults. Surrey Heath and Reigate and Banstead have the highest prevalence at 65.54% and 63.3% compared to Guildford and Elmbridge who have the lowest at 57.4% and 58.2% respectively. A new PHE-led study published in The Lancet ranks the diseases and risk factors that cause death and disability in England. Diet was identified as a specific risk factor accounting for 10.8% of the total burden of disease. The proportion of adults meeting the recommended “5 a day”, on a usual day is again higher than the national average (52.3%) at 57%, however there is variation between boroughs with Waverley achieving the highest at 61.9% and Spelthorne the lowest at 49.7%. This means that slightly less than half the adult population of Surrey achieves “5 a day”, which is equivalent to approximately 450,000 adults. When we break this down to view the number of fruit or vegetable portions making up the “5 a day” we see a variation. Guildford consumes the most fruit portions with an average of 2.92 while Runnymede at 2.28 portions consumes the least which is significantly lower than the national average. Waverley consumes the most vegetable portions (2.54) and Spelthorne the least although neither of these is significantly different to the national average of 2.25 portions. Nationally fruit and vegetable consumption is higher in women than men and higher consumption is associated with higher income (27). Public Health England (PHE) launched the ‘One You’ campaign in 2016 to help adults across the country avoid future diseases caused by modern day life. ‘One You’ aims to encourage adults, particularly those in middle age, to take control of their health to enjoy significant benefits now, and in later life. The campaign targets every day habits and behaviours such as eating too much unhealthy food, drinking more than is recommended, continuing to smoking and not being active enough. ‘One You’ also provides information on how people can reduce their stress levels and sleep better. The Healthy Surrey website was set up by the Surrey Health and Wellbeing Board to act as an online resource for Surrey health and wellbeing information. The website includes information and advice on health issues and provides links to local services across Surrey. MECC encourages conversations based on behaviour change methodologies (ranging from brief advice, to more advanced behaviour change techniques), empowering healthier lifestyle choices and exploring the wider social determinants that influence all of our health. In Surrey, a pilot project is being run with Adult Social Care and Public Health. The Workplace Wellbeing Charter is a statement of intent that demonstrates the commitment of employers to the health and wellbeing of their employees. The aim of the Charter is to support employers to maximise the potential of their staff, and to make small changes that impact positively on staff health and wellbeing. The Charter focuses on the three key elements of Leadership, Culture and Communication that can help employers receive maximum benefit and return from employee health and wellbeing. Stop smoking Services provide support across Surrey and offer either one-to-one or group support by trained stop smoking practitioners, delivering evidence based behaviour support and stop smoking medications. Services provide training and support for GPs and Pharmacies who also deliver the stop smoking programme. The Surrey Tobacco Control Strategy 2016-21 sets out why and how Surrey needs to work together to reduce the harmful effects of tobacco. Led by Surrey County Council Public Health this multi-agency approach is owned and delivered by the Smokefree Surrey Alliance. The strategy and alliance ensure effective and coordinated action across the County by a wide variety of partners and agencies to tackle the greatest cause of premature death and health inequalities. The five priority areas are: Tackling health inequalities and helping tobacco users to quit; Helping young people to be tobacco free; Establishing ‘smokefree’ as the norm; Tackling illicit tobacco; Raising the profile of tobacco control. Don’t Bottle It Up is an interactive web-based screening tool that allows people to work out the level of risk they are at as a result of their drinking and access personalised advice anonymously online. The website uses the World Health Organisation’s validated Alcohol Use Disorders Identification Tool (AUDIT) to deliver Identification and Brief Advice within the community. Alcohol Scratch Cards are distributed in a wide range of community settings (ie GP surgeries, leisure centres, community events). The scratch cards allow people to work out if they are at risk of alcohol-related health harm and if so, direct people to Surrey Drug and Alcohol Care telephone helpline and Don’t Bottle It Up for further assessment and advice. Currently there are no commissioned community weight management services for adults, although a number of commercial options are available for a charge. The NHS Weight Loss Plan, a 12 week adult weight management programme, is available on the NHS Choices website which can be accessed free of charge. Public Health provide healthy eating and weight management information on the Healthy Surrey website. North West Surrey Clinical Commissioning Group (NWSCCG) are lead commissioners for an Adult Tier 3 Weight Management Programme however this is currently under review. Bariatric surgery is available through NHS Specialised commissioning, however before that can be agreed, patients have to meet the strict criteria. Surrey leads on the Eat Out Eat Well Award, recently refreshed in partnership with Public Health England and available across Surrey. Many public and commercial organisations have achieved this “healthy catering award”, further development and roll out is planned. This programme was launched in January 2016 to provide a range of very low cost physical activity opportunities for the 50+ population across Surrey. Activities include swimming, golf, jogging, badminton, bowls, dance & exercise, inclusive multi-sports and walking football. Patients who are insufficiently active and have a health condition (or other factors that put them at increased risk of ill health) can be referred by their GP to an exercise referral programme (which operate in every Surrey borough except for Epsom & Ewell). Many of these also provide specialised classes in Cardiac Rehab, Stroke, COPD, Diabetes Mellitus and Weight Management. Further information is available by contacting the relevant exercise referral coordinator in each borough. For people who are insufficiently active but do not have a health condition, GPs/allied health professionals and other frontline staff in community/acute settings can signpost to the wide range of low impact activities on offer in each district or borough: www.healthysurrey.org.uk/assets/documents/low-impact-activities. The Travel SMART website contains useful information on how to travel sustainably in Surrey, with the aim of reducing one’s carbon footprint. This also has the benefit of increasing physical activity levels. Information includes details of public transport, park & ride schemes, cycle routes, cycle hire schemes, taking bikes on trains, electric bikes and cycle training. The NHS Health Check (HC) programme is a national cardiovascular disease (CVD) risk assessment programme. The responsibility for this programme transferred from the NHS to local authorities in March 2013. The HC provides a personal review of the behavioural factors – such as smoking, inactivity, harmful drinking and obesity – that increase the risk of developing a heart attack or stroke, and offers professional advice and referral to lifestyle services to support behaviour change. It also helps to detect undiagnosed serious conditions such as hypertension, diabetes and chronic kidney disease. The programme in Surrey is provided by many GPs and Pharmacy teams and some community based organisations (see Healthy Surrey website). Participating GPs practices will be prioritising eligible patients who have higher risk factors for CVD to improve health outcomes for Surrey residents. Data Surrey records the numbers of Health Checks offered and numbers received. Integrated health and wellbeing services. Partnership working to maximise collection, sharing and use of alcohol-related health data in order to reduce alcohol-related harm. Historically many public health initiatives have been provided on a programme basis. There has been an increase in the emergence of integrating public health services such as weight management, stop smoking and NHS Health Checks into one individually commissioned programme with a single point of access. NHS Confederation and the Faculty of Public Health (2011) argued that ‘Wellness’ services provide support to people to lead healthier lives. The Wellness approach goes beyond looking at a single-issue, healthy lifestyle services and a focus on illness, and instead aims to take a whole-person and community approach to improving health (28). However, the Kings Fund argue that due to shortages of academic research evidence on the usefulness and cost-effectiveness of different approaches, commissioners will need to innovate and take risks (2). If integrating health behaviour services, commissioners need to consider the available resources, intervention intensity and delivery, and the target population. All of these factors impact on the effectiveness, and likely cost-effectiveness, of multiple risk behaviour interventions (3). Consideration needs to be given to the impact that integrated wellbeing has on an individual’s health and wellbeing. The Wellness Services Evidence Based Review (29) identifies a number of benefits to people accessing integrated wellbeing services. For example promoting positive health that can empower individuals, enabling them to maintain and improve their own health, and a focus on promoting quality of life not just length of life. Wellness services should take into consideration inequalities in health and where possible actively seek out those individuals that do not usually benefit from mainstream health services (18). The National Centre for Smoking Cessation and Training (NCSCT) undertook a review of the evidence on integrated health behaviour lifestyle services. Based on four risk behaviours studied (tobacco smoking, hazardous alcohol use, poor diet and physical inactivity), the report concluded that only specific risk behaviours cluster together (3). A moderate number of risk behaviours (two to three) targeted together result in the biggest improvements in outcome and that the effectiveness and cost-effectiveness of multiple risk behaviour interventions depend on the behaviour targeted (3). While there is some evidence to support multiple risk behaviour interventions that target poor diet and physical inactivity, there is little evidence that targeting tobacco use in this manner is either effective or more cost-effective than single risk behaviour interventions (3). There are examples across the country of local authorities with integrated models that have begun to evaluate services and outcomes. These outcomes will help provide further evidence and guidance on developing integrated models. The Department of Health recommends the use of the six internationally recognised strands of tobacco control to combat local tobacco use. Since April 2013 all shops have been required to remove tobacco products from display. By May 2017, all cigarettes and hand rolling tobacco sold in the UK will be in standardised packaging. The health gain from high-priced tobacco, can be undermined if smokers have access to cheaper, illicit products which are sold illegally. HM Revenue & Customs (mid-range) estimates for 2013/14 were that 10% of cigarettes consumed in the UK were illicit, and the proportion of hand rolled tobacco that was illicit was 39% (30). There has been an introduction of numerous government policies surrounding smokefree public places, workplaces and vehicles, the display of tobacco products and cigarette packaging, the regulation of e-cigarettes and proxy purchasing of tobacco products. It would be expected that these measures will help facilitate a reduction in smoking and smoke related harm. Smokers are four times more likely to be successful at quitting if they receive behavioural support than if they quit on their own. Research shows that over-targeting priority smoking groups is the best way to tackle smoking prevalence amongst these demographics. Mandatory Carbon Monoxide (CO) screening for all pregnant women. Although the best way to avoid harm from smoking is to quit entirely, there are other ways of reducing the harm from smoking, even though this may involve continued use of nicotine. The large majority of the more than one million users of electronic cigarettes in the UK are current or former smokers. Most users use them to either replace cigarettes in places where smoking is prohibited or discouraged, to cut down on smoking, to reduce harm from smoking, or to quit smoking. Evidence indicates that e-cigarettes can help people quit smoking, with similar or better results than nicotine replacement therapies (31). Partnership working across organisations and health care professionals has proved to be key in recruiting and retaining smokers to the stop smoking services. Tobacco Control Alliances have been proven effective in countering illicit tobacco activity in local areas. Smokefree laws are proving to be effective and popular. In 2016, Surrey County Council worked in partnership with borough and districts to launch a voluntary smoking ban in children’s play areas. Many Surrey County Council partners are working on smokefree policies by removing designated smoking areas and making their grounds smokefree. Surrey County Council will also be exploring an update to their policy. Incorporating communication strategies into the local tobacco control plans can increase the effectiveness of national and local smokefree campaigns. Local stop smoking services should align their campaigns with national materials and campaigns. Improved early identification and intervention in primary care has been shown to avert both alcohol-related admissions and A&E attendances (32). Identification, Brief Advice and Extended Brief Interventions (EBIs) have a high degree of efficacy and cost-effectiveness and should be delivered by health and social care professionals in primary care, secondary care and in the community (33, 34, 35, 36). 1 in 8 people drinking above recommended levels who receive simple alcohol advice will reduce their drinking to within lower risk levels (37). Higher risk and increasing risk drinkers who receive IBA are twice as likely to moderate their drinking 6 to 12 months after an intervention when compared to drinkers receiving no intervention (38). There is strong evidence that local licensing policies are associated with a reduction in alcohol-related hospital admissions in areas with more intense licensing policies (39). National Institute for Health and Care Excellence (2010) Alcohol use disorders: preventing harmful drinking. NICE public health guidance 24. National Institute for Health and Care Excellence (2011) Alcohol-use disorders: diagnosis, assessment and management of harmful drinking and alcohol dependence. NICE clinical guidance CG115. National Institute for Health and Care Excellence (2015) Alcohol: preventing harmful use in the community. NICE quality standard 83. National Institute for Health and Care Excellence (2014) Behaviour change: individual approaches. NICE public health guidance 49. Physical activity in the workplace (PH13) (40) Physical activity programmes at work have been found to reduce absenteeism by up to 20% with physically active workers taking 27% fewer sick days (41). It is recommended that employers encourage and support employees to be more physically active. Physical activity and the environment (PH8) (42)Planning applications for new developments should always prioritise the need for people to be physically active. When developing or maintaining streets and roads, pedestrians/cyclists and users of other modes of transport involving physical activity should be given the highest priority. Brief interventions in primary care are a cost effective way to increase physical activity levels in adults. Physical activity: exercise referral schemes(PH54) (44) Exercise Referral schemes are recommended for people who are sedentary or inactive and have an existing health condition, or other factors that put them at increased risk of ill health (e.g. being overweight/obese). These schemes are not recommended for people who are sedentary or inactive, but otherwise healthy (for whom brief advice and signposting to local activities would be recommended). As well as increasing physical activity levels, walking and cycling can help reduce car travel leading to reductions in air pollution; reduce road danger; increase the number of people on the streets making public spaces seem more welcoming; and provide an opportunity for people to participate in the outdoor environment. These benefits may be particularly significant for people with disabilities whose participation in other activities may be more restricted. Recommendations to help maintain a healthy weight and prevent excess weight gain include encouraging people to be more active and reduce sedentary behaviour; encouraging people to build activity into daily life; developing routines and habits that gradually increase the amount and intensity of activity they do. Multifactorial interventions which include muscle strengthening and balance training should be offered to older people (65+) assessed as being at risk of falling or having had recurrent falls and/or balance/gait deficit. A lack of regular physical activity along with a sedentary lifestyle increases the risk of dementia. For older adults, there is evidence that physical activity can have beneficial effects on maintaining or improving cognitive function (48). Being close and having access to green spaces in residential areas is positively associated with increased overall levels of physical activity across age groups. Amongst older people five year survival rates are positively associated with proximity of access to space for walking, nearby parks and tree-lined streets, independent of socioeconomic status (49). In the UK a correlation has been observed between those living closest to greener areas and reduced levels of mortality, obesity and obesity-related illnesses. This has been linked to higher levels of exercise, but causality has not been demonstrated (50). Excess weight may increase the risk of many co-morbidities including type 2 diabetes and coronary heart disease. NICE Guidance recommends interventions in which weight is not the primary outcome, such as those aimed at preventing cardiovascular disease or type 2 diabetes, improving mental wellbeing or increasing active travel (51). The Foresight Obesity Systems Atlas (52) highlights the need for a whole system approach, where health is taken into account in every policy and decision across local government and private sector with the aim of making the healthy choice, the easy choice. National Institute of Healthcare Excellence (NICE) has a number of guidance documents which provide recommendations to tackle healthy weight, in which they recommend prevention and self-care with additional support for those most at risk, and that activities are integrated into current services taking a local strategic approach to healthy eating and healthy weight. The government launched a “healthy lifestyle” campaign Change4Life (C4L) in 2009. Its aim is to inspire a broad coalition of people, including the NHS, local authorities, businesses, charities, schools, families, community leaders to all play a part in improving the nation’s health and well-being by encouraging everyone to eat well, move more and live longer. A sister brand, Start4Life, introduces healthy habits right from birth and the Public Health England campaign, “One You” is aimed at adults. Ensure pedestrians, cyclists and users of other modes of transport involving physical activity are given the highest priority when developing or maintaining streets and roads (including people whose mobility is impaired). Plan and provide a comprehensive network of routes for walking, cycling and using other modes of transport involving physical activity. Through the Workplace Wellbeing Charter group provide information to Surrey employers on how to be more physically active, including information on/links to local opportunities for physical activity, both within and outside the workplace. Given the numbers affected by poor diet and unhealthy weight, a universal approach is needed; together with targeted initiatives towards those most at risk. Tacking a “whole system” approach will help to reduce the influence of the “obesogenic environment”. Explore options to provide single point of contact for referrers and the public for health and wellbeing service. Social marketing should be targeted to the times when people are at risk of taking up unhealthy behaviours – whatever they may be and/or to life events when there are particularly good opportunities to help them change, such as pregnancy. Implement CQUIN for NHS providers encouraging mandatory recording of smoking status, undertaking VBA, referral to stop smoking service and prescribing of stop smoking medications. Ensure brief advice on physical activity is incorporated into care pathways of certain conditions such as cardiovascular disease, stroke, type 2 diabetes and mental illness. Ensure brief advice on physical activity is incorporated into services for groups that are under-represented, such as people over 65, people with a disability, BME groups and people in lower income households. Achieve Workplace Wellbeing Charter for CCG staff. Ensure planning applications for new developments prioritise the need for people (including those whose mobility is impaired) to be physically active as a routine part of their daily life. Ensure public open spaces and public paths can be reached on foot, by bicycle and using other modes of transport involving physical activity. They should also be accessible by public transport. Those involved with campus sites, including hospitals and universities, should ensure different parts of the site are linked by appropriate walking and cycling routes. During building design or refurbishment of workplaces, ensure staircases are designed and positioned to encourage people to use them, clearly signposted and attractive to use. Ensure new workplaces are linked to walking and cycling networks. Roll out of healthy eating and weight management training across NHS frontline staff. Roll out of Workplace Wellbeing Charter to include healthy eating and weight management for employees. Target people who are at risk of taking up unhealthy behaviours – whatever they may be and/or to life events when there are particularly good opportunities to help them change, such as pregnancy. (17) Murray et al. (2013) UK health performance: findings of the Global Burden of Disease Study 2010. The Lancet 381: 997-1020. (18) Lee I-M et al. (2012) Effect of physical inactivity on major non-communicable diseases worldwide: an analysis of burden of disease and life expectancy. The Lancet 380: 219–229. (20) Department of Health (2011) Start active, stay active. [Adapted from US Department of Health and Human Services (2008) Physical activity guidelines advisory committee report. Washington DC: US Department of Health and Human Services]. (21) National Institute for Health and Care Excellence (2013) Physical activity: brief advice for adults in primary care (PH44). Available at: https://www.nice.org.uk/guidance/ph44. (25) Buckley JP et al (2015) The sedentary office: a growing case for change towards better health and productivity. British Journal of Sports Medicine 0:1–6. (29) Winters, Armitage, Stansfield, Scott-Samuel and Farrar (2010). Wellness Services – Evidence based review and examples of good practice. November 2010. Observatory Report Series No. 76. (33) National Institute for Health and Care Excellence (2010) Alcohol use disorders: preventing harmful drinking. NICE public health guidance 24. (34) National Institute for Health and Care Excellence (2011) Alcohol-use disorders: diagnosis, assessment and management of harmful drinking and alcohol dependence. NICE clinical guidance 115. (35) National Institute for Health and Care Excellence (2015) Alcohol: preventing harmful use in the community. NICE quality standard 83. (36) National Institute for Health and Care Excellence (2014) Behaviour change: individual approaches. NICE public health guidance 49. (37) Moyer, A., Finney, J., Swearingen, C. and Vergun, P. (2002) Brief Interventions for alcohol problems: a meta-analytic review of controlled investigations in treatment -seeking and non-treatment seeking populations, Addiction, 97, 279-292. (38) Wilk, A.I., Jensen, N.M. and Havighurst, T.C. (1997) Meta-analysis of randomized control trials addressing brief interventions in heavy alcohol drinkers, Journal of General Internal Medicine, 12, 274-283. (41) Health, Work and Wellbeing Programme (2008) Working for a healthier tomorrow. London: The Stationery Office.